Confession time: I’m one of those people who never got over The Rocky Horror Show. More specifically, I never got over The Rocky Horror Picture Show, starring Tim Curry and Susan Sarandon. Second confession: I don’t feel the need to. I love it. Every part of it. The performances. The look. The music. The humor. The absurdity. The effects. The costumes (or lack thereof). I’ve loved it ever since I first laid eyes on it. I’ve seen it at high school parties, packed college playhouses, and dorm rooms at 3am. I’ve seen it straight and I’ve seen it with roaring crowds and I’ve seen it with amateurs just trying their best. I’ve seen it, I’ve lived it, I’ve injected it into my veins and grooved with it. But I had never seen it on stage. Until now. I have never seen anything like Rocky Horror in Stratford’s long history, which alone makes it worth the price of admission. Sure, I’ve seen productions that struck a chord in me like Dangerous Liasons or The Tempest, entertained me like Tommy and Blithe Spirit, thrilled me like Richard III or Cyrano de Bergerac, and I’ve seen productions that knocked my socks off. 2014’s production of A Midsummer Night’s Dream is still the best experience I’ve ever had in a theater, period. But this was something different. This was a riot. What comes next is a rollercoaster of sexploration and discovery. This is the kitchen sink of musicals. The sudden reveal of extra-terrestrial life is never explained, and if you’re looking for a handrail to hold onto, you’re in for a rough ride. But for those with a sense of humor, who embrace the sudden turns and ludicrous twists, and the (for Stratford) shocking innuendoes, this show is a blast. The energy of the entire production is unmatched by anything this season and director Donna Feore leaves nothing behind. The stage utilizes wonderful, electric sets by Michael Gianfracesco and L.E.D. screens with a Terry Gilliam/Monty Python aesthetic. The costumes by Dana Osborne are cut almost literally from the same cloth as the movie, but I’m fine with that. I’ve seen Rocky Horror when it tries to be too different, and I hated it. The cast acquit themselves more than admirably, although it’s hard to watch them without imagining the film projected behind them. Jennifer Rider-Shaw brings a bubbling, “just screw me already!” urgency to Janet not present in the film, and Sayer Roberts plays Brad with the rigidity of a cardboard cutout. Kimberly-Ann Truong doesn’t steal scenes so much as the play stops for her to show off her human dynamo-like energy, and Erica Peck and Robert Markus bring Broadway level vocals to their roles as Magenta and Riff Raff. Steve Ross may have hit his peak as the Narrator, a role that no one else in Stratford could have played. But it is Dan Chameroy as Dr. Frank N. Furter who runs away with the show. As it should be. He plays the role even broader than Curry. He’ll never match him (Curry should have won an Oscar for the role that still defines him), but Chameroy simply dares you to contradict his greatness. 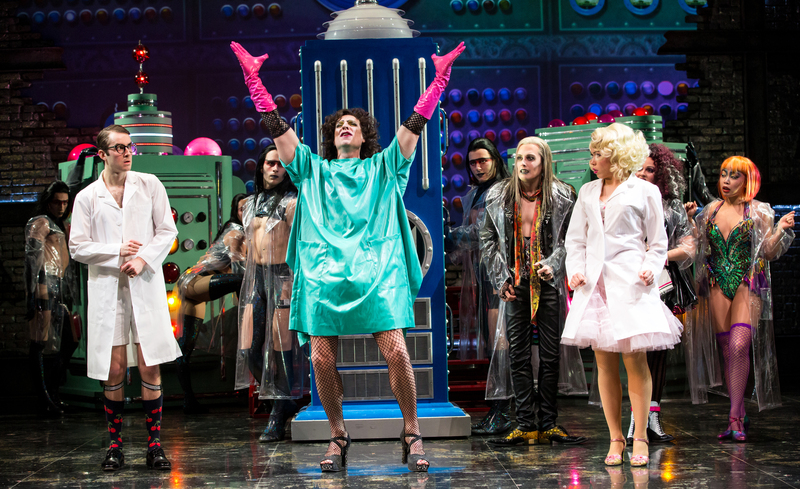 Is The Rocky Horror Show one of the best musicals ever? Possibly. The Rocky Horror Picture Show slips effortlessly into my top five film musicals of all time, right behind Sweeney Todd and just before Chicago. What can I say? I’m a sucker for murder musicals. But the play stands on it’s own, not just in its specific niche, but in the whole genre. It’s not only one of the best musicals Stratford has ever put on, it is easily the best show of the season! The show continues until Halloween night. Go!